At the turn from the 19th to the 20th century the inconvenience with the new rollfilm cameras concerning the way of estimated image composition through the viewfinder led to a new type of camera, the combination camera. This type had a rollfilm back that could be swung out of the focal plane to give place for a ground glass. Blair offered the No. 3 Combination Hawk-Eye. Manhattan Optical sold its Wizard Duplex. And Kodak its No. 4 Screen Focus Kodak. 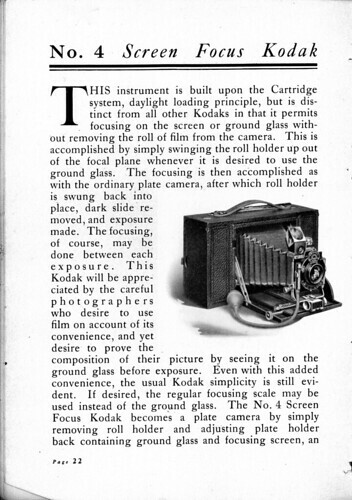 The rollfilm back could be removed completely so that the camera served as 4×5" plate camera. 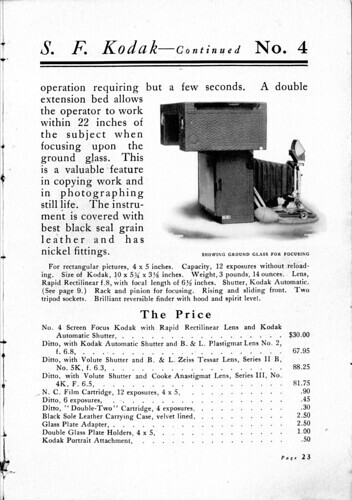 In 1905 the camera was equipped with Rapid Rectilinear lens and a Kodak Automatic shutter. It had a rising and sliding front and even a viewfinder, a brilliant reversible finder with hood. It used type No. 123 roll film for 4×5" exposures. It was a very expensive camera, The concurrent model of Blair did cost just one third. However, ca. 4000 No. 4 Screen Focus were made.